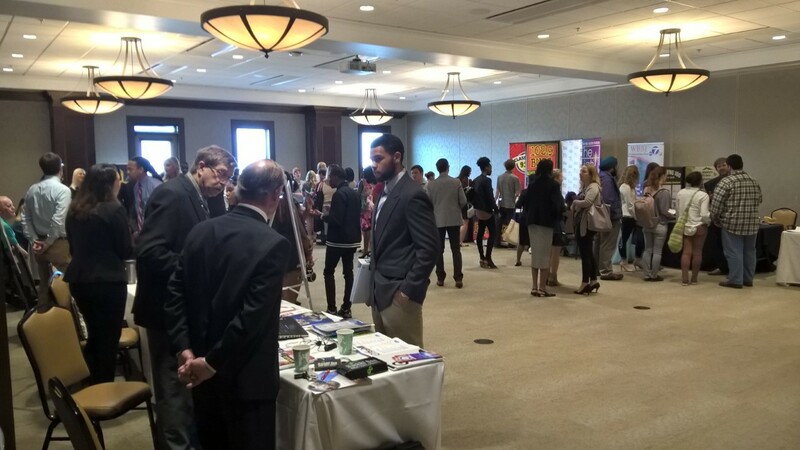 On March 25, Belmont University hosted an all-day career fair for 130 students in the Nashville area who are working towards careers in broadcasting, television and journalism. The event was sponsored by the National Association of Television Program Executives (NATPE) with help from iHeartMedia, the Tennessee Association of Broadcasters (TAB), the National Academy of Television Arts and Sciences (NATAS) Nashville/Midsouth EMMY Chapter, News 2 WKRN-TV and Belmont’s own New Century Journalism Program. The event consisted of scholarship drawings, a panel discussion led by local television and broadcasting professionals and a job interview demonstration featuring Belmont senior mass communications major Madison Blevins. Three area students received scholarship awards of $1,500 given out by 101.1 The Beat on-air personality Zach Boog, compliments of iHeartMedia. Additionally, 15 booths were set up and manned by local broadcasting stations and media organizations, giving students the opportunity to network and ask questions of local distinguished experts. To conclude the fair, students were invited to take a tour of the News 2 WKRN-TV studio on Murfreesboro Rd. Chair of Belmont’s Media Studies Department and initiator of the Journalism program Thom Storey began the event with a welcome message, followed by NATPE CEO and President JP Bommel, iHeartMedia Region President Dan Endom, TAB President and Executive Director Whit Adamson and NATAS Nashville/Midsouth EMMY Chapter National Trustee and President Clifton Hunt. Panelists represented Warner/Chappell Production Music, News 2 WKRN-TV, WRLT Lightning 100, Bohan Advertising, WME Entertainment, NewsChannel5, WSMV, iHeartMedia and Nashville Public Television.